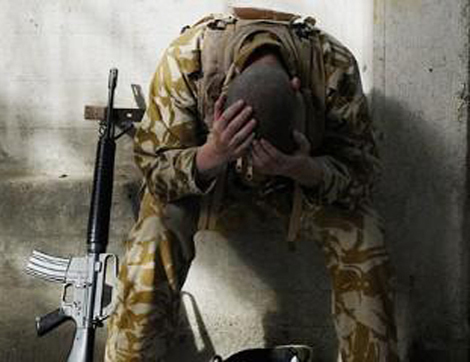 Global Non-Compliance website > Military Suicides Plague U.S.
For the second year in a row, more U.S. soldiers in Iraq and Afghanistan have committed suicide than died in battle, according to recent statistics released by the Pentagon. This is an unprecedented trend that has the military’s top brass as well as the White House looking for answers. “If you know the one thing that causes people to commit suicide, please let us know, because we don’t know,” Gen. Peter Chiarelli told Army Times. Specifically, 468 soldiers have taken their own lives this year versus 462 who were killed in combat. The problem is, many soldiers coming home from war suffer a variety of psychological problems caused by multiple tours of duty in the Middle East. They have been diagnosed with deep depression, substance abuse, anxiety and posttraumatic stress disorder. To this cornucopia of psychological afflictions, several causes have been attributed. There is the trauma of seeing a friend blown to pieces in front of your eyes or being forced to kill innocent people that have done absolutely nothing to you. There is also an increasing number of violent street-gang members, criminals and homosexuals enlisting in the military as recruiters continue to lower their standards in what has become the biggest “growth industry” in today’s economy. The government has always depended on propaganda in order to give troops the incentive to kill the enemy. That job is rendered easier when foreign nations attack one’s own country. The objectives are much clearer when troops believe they are fighting to defend their country and family from invaders or a foreign oppressor. Suicide among the troops wasn’t a problem in the War of Independence or the War of 1812. During WWII, few suicides were reported, due to the perception that foreign enemies had attacked us first at Pearl Harbor (hardly anyone realized, at the time, that the Japanese had deliberately been set up by FDR). Selling the war became harder in Vietnam where our soldiers were asked to kill “the yellow man” simply for an ideology. In Iraq and Afghanistan, the problem is much bigger because both wars are based on multiple, blatant lies. More and more Americans today reject the lies told about 9-11 and are seeing it as an inside/Mossad job. In Afghanistan, the enigmatic Osama bin Laden—the supposed culprit whose capture was said to be the objective of our invasion—has already “died” at least twice, but months or years later the U.S. military continues to fight in that country for no clear reason. The U.S. invaded Iraq and killed hundreds of thousands of civilians, while thousands of our own boys died, under the pretense that weapons of mass destruction threatened the United States. Even the least philosophical soldier has to wonder why his best friends were killed in a never-ending, meaningless, illegal and no-win war. Instead of chasing psychobabble phantoms in therapy sessions with traumatized GIs, the top brass should be looking for ways to bring the troops home immediately. That could solve the growing suicide problem. Peter Papaherakles, a U.S. citizen for more than 35 years, was born in Greece. He is AFP’s outreach director. If you would like to see AFP speakers at your rally, contact Pete at 202-544-5977. Military Suicides Plague U.S. | Military | Suicides | Plague | U.S.